Body lift is a technique used to lift/raise the body or cab of a vehicle from its chassis. The body lift is achieved by adding polyurethane or aluminum blocks between the vehicle’s body and body mounts. The body lift is the simplest solution to lift a vehicle and is easy to install. It is relatively cheap and costs a few hundred dollars. The body lift is built over the stock suspension setting, so no wheel alignment is required. The body raise is not substantial – it can be up to 3 inches. A gap may be visible between the body and the chassis. 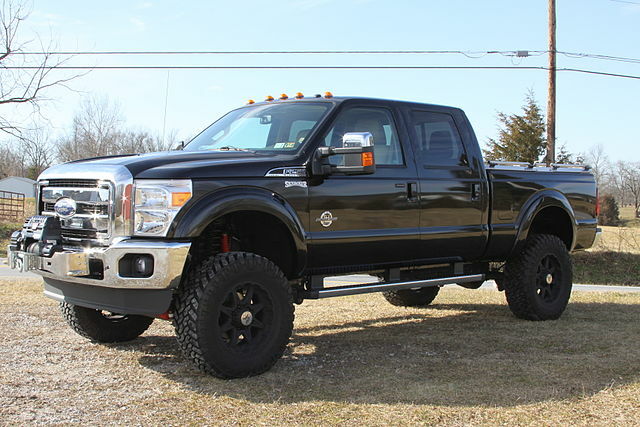 The body lift raises the ride-height and adds fender clearance to allow the installation of bigger tires. It is not affecting the suspension geometry, ride or handling quality. It is more related to the appearance of the vehicle than to its performance. It makes the vehicle look better, but isn’t really useful for off-roading and dirty terrains. The body lift has to be done carefully, because the installation of bigger tires may hamper the tire clearance. Suspension lift is a technique used to lift/raise the height of the vehicle’s suspension. This is the most popular lifting solution. The lift is possible by replacing the stock suspension components of the vehicle with new ones which include longer coil springs, coil spring spacers, torsion bar keys, heightened leaf springs, etc. Suspension lift provides improved suspension and allows the use of wider and bigger tires without hampering the vehicle’s clearance. The ground clearance after a suspension lift can be increased with up to 12 inches. The suspension lift is more expensive than the body lift. It can be difficult to install and requires more time. 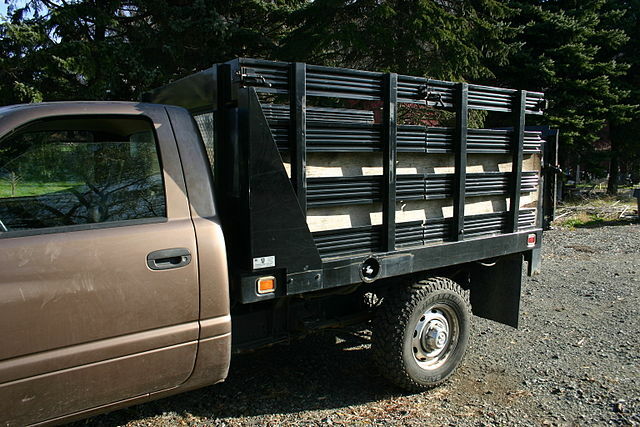 Unlike in a body lift, there is no visible gap between the body and the chassis of the vehicle. The suspension clearance affects the suspension geometry, so it requires a wheel alignment. The suspension lift manipulates or replaces the stock suspension framework, which leads to a significant improvement in the shock-absorbing capacity. It affects the handling of the vehicle and provides an effective tire and ground clearance. It makes the vehicle adaptable to uneven, rocky terrains and is very useful in terms of off-road driving. The suspension lift has to be done very carefully – too much lifting can affect the steering geometry. This may result in instability of the vehicle and cause significant tire wear on independent front suspension rigs or alignment issues in solid axle rigs. The raised center of gravity can increase the tendency of the vehicle to roll over. Body lift: Body lift is a technique used to lift/raise the body or cab of a vehicle from its chassis. Suspension lift: Suspension lift is a technique used to lift/raise the height of the vehicle’s suspension. Body lift: The lift is done by adding polyurethane or aluminum blocks between the vehicle’s body and body mounts. Suspension lift: The lift is done by replacing the stock suspension components of the vehicle with new ones which include longer coil springs, coil spring spacers, torsion bar keys, heightened leaf springs, etc. It can be difficult to install and requires more time. Body lift: The body lift is relatively cheap and costs a few hundred dollars. Suspension lift: The suspension lift is more expensive than the body lift. It increases the fuel consumption of the vehicle. Body lift: The body raise can be up to 3 inches. Suspension lift: The body raise can be up to 12 inches. Body lift: The body lift does not raise the chassis, only the body itself. Suspension lift: The suspension lift raises the body and chassis together. Body lift: The body lift does not add ground clearance. Suspension lift: The suspension lift adds ground clearance. Body Lift: The body lift does not affect the suspension/wheel geometry, so it does not require realignment. Suspension Lift: The suspension lift alters the suspension/wheel geometry and requires realignment. Body lift: The body lift does not provide off-road performance gains. Suspension lift: The suspension lift adds ground clearance and improves the off-road performance. Body lift: The body lift does not affect the comfort and security. Suspension lift: The suspension lift raises the vehicle’s center of gravity and may compromise safety. It affects in-town and highway ride comfort. Body lift is a technique used to lift/raise the body or cab of a vehicle from its chassis. Suspension lift is a technique used to lift/raise the height of the vehicle’s suspension. The body lift is done by adding polyurethane or aluminum blocks between the vehicle’s body and body mounts. The suspension lift is done by replacing the stock suspension components of the vehicle with new ones. The body lift is relatively cheap, while the suspension lift is more expensive and increases the fuel consumption of the vehicle. The body raise after a body lift is up to 3 inches, while after a suspension lift is up to 12 inches. The body lift does not raise the chassis, while the suspension lift raises the body and chassis together. The body lift does not add ground clearance, while the suspension lift adds ground clearance. The body lift does not affect the suspension/wheel geometry, so it does not require realignment. The suspension lift alters the suspension/wheel geometry and requires realignment. The body lift does not provide off-road performance gains, while the suspension lift adds ground clearance and improves the off-road performance. The body lift does not affect the comfort and security. The suspension lift raises the vehicle’s center of gravity and may compromise safety. It affects in-town and highway ride comfort. Dr. Mariam Bozhilova Forest Research Institute, BAS. 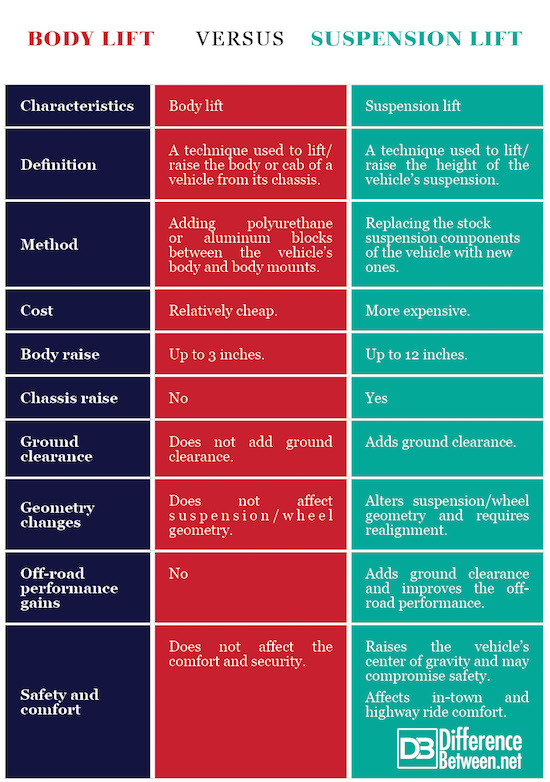 "Difference Between Body Lift and Suspension Lift." DifferenceBetween.net. January 31, 2019 < http://www.differencebetween.net/object/auto-object/difference-between-body-lift-and-suspension-lift/ >. Allen, J. Four-Wheeler's Bible. St. Paul: MBI Publishing Company. 2002. Print. Munroe, C. Chassis & Suspension Handbook. New York. HPBooks. 2003. Print. Queensland Code of Practice – Vehicle Modifications, Transport and Main Roads, February 2018.